The Wick family took up residence in “Summerdale” (171) High Street in September 1938 when my father Frederick James Wick (Jim) from Little Shelford, married my mother Muriel Joan Hall the shopkeeper’s daughter from Barrington. When war broke out Jim joined the Royal Artillery, the regiment of his father and his two brothers, whilst Muriel spent much of her time helping in the Barrington shop, staying there for quite a lot of the war. They both returned to the house when Jim was on leave, and they allowed family members from London to stay there for holidays such as Honeymoons. My brother, Peter James Wick, was born in the house in 1942, attended in those days by Dr Young, the local nurse, and Muriel’s cousin Joyce Brewster. 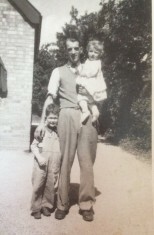 After his Demobilisation in 1946 Jim and Muriel returned to the family home. It was then that I was born in 1947, and I believe the same team officiated at my birth in the front bedroom of Summerdale. Instead of going back to farm work, my father, Jim, used skills he had learned in the Army, to work for Ron Bass in the garage. Whilst he was working at Bass’s, I recall an incident where some pigsty’s situated at the back of the White’s property, to the south of the garage, caught fire and my father, being familiar with handling pigs went into the burning sheds and rescued them. He subsequently worked for Camtiles at Hauxton, and later Sawston, in various roles including works manager and quality manager. My father, Jim was a Harston parish councillor for several years, and a deacon of the Baptist Church, whist also serving other churches as a preacher for over fifty years. My mother had been an organist at Barrington chapel before her marriage, but never pursued this talent in Harston Baptist until later years, when she played the piano for the woman’s meeting on Wednesday afternoons. My widowed Grandfather John Frederick Hall lived at Summerdale with the family after my Grandmother died, and for many years travelled daily back to Barrington by car to run his Grocery and Drapery store, and later by bus bringing his paperwork and money from the till home in a cardboard box. 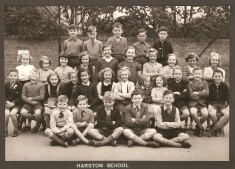 Upon retirement he added Harston Over Sixties Club to his membership of the same organisation in Barrington, staying with both until his death at ninety three. My mother Muriel died in 1992 and my father Jim followed in late 1994. I actually left the village in 1972 when I married, but still returned most weeks to see my parents until 1994. Our garden was 220 yards long and 22 yards wide at the back and 11 yds wide at the front, so we had our own adventure playground in the form of orchards and sheds to play in, as it seemed many of our friends had as well. The house was one of a pair of semi-detached houses built and lived in by Mr Harradine, a local builder. He kept three quarters of the acre plot for himself, and sold the other house with a quarter of an acre of garden. It was his work sheds, that spanned the garden at the widest part, where we played. Our father variously kept pigs, chickens and geese in these sheds that were only knocked down after both parents’ deaths. The format of the garden changed many times, with the removal of parts of the orchard to grow vegetables, chicken runs and pig wire came and went, then as my parents grew older much of it was set down to grass and parts “close cut” as a putting green between the trees. Mr Harradine had brought up a family in the house, most of them being born in the same room as we were, then he moved to London Road to build a larger house and later a house next door to that for one of his daughters, Alma. Another daughter Joan Waitman had a house built in London road within sight of Summerdale. During my primary school years Alma’s two children Bobby and Marsha were good friends, and I remember many hours spent playing around Wisbeys gravel pits behind their home in London Road: also they had a Television where I saw the new commercial channel for the first time. The High Street was always busy, being the main road to London and there were many accidents outside our house. Our front wall was knocked down twice, once by a car and once by a lorry. I remember one particular accident when a man crashed his sports car and in doing so lost his ear, only to have another crash some months later between the Queens Head and the Memorial. On this occasion he was seen afterwards walking along the road trying to find his prosthetic ear! Constable Brookbanks and later Kilbey used to cycle round the village and position themselves, sometimes at night, on the traffic island in front of the Old English Gentleman. There they would meet with the police cars from the traffic division, and the RAC and AA men who would park their Motor Cycle combinations there waiting for a call. There was an RAC box there which one night found itself nearer the pub front door than the centre of the Island, courtesy of a driver who didn’t make the bend coming in to the village. Despite the road being busy and there being three Eastern Counties double decker buses traveling into Cambridge each morning, there would be a steady flow of cyclists cycling to work or school in Cambridge each morning. As people became more affluent some progressed to Vespa or Lambretta scooters, then finally cars. My childhood memories were looking out of the upstairs window waiting for various regulars to cycle past. Mr and Mrs Mathews lived in the last house on the left as you leave the village, and after that I remember the Turnbull Family; they actually built a canoe using the Scout mould. Jean Boulton, Muriel, Jim & Peter Wick, early 1950s. Les Boulton and his first wife Gladys were next and lived in Wood Glen, 175, with daughter Jean and Gladys’ mother Mrs Harradine ( I think she was sister in law to the Harradine that built our house). The Boultons along with the Wicks attended the Baptist chapel. The photo shows Jean Boulton, Muriel, Jim and Peter Wick coming out of a Youth For Christ Rally at the City Restaurant in Petty Cury. Leslie and Gladys had an immaculate lawn which was set out as a tennis court in summer months. 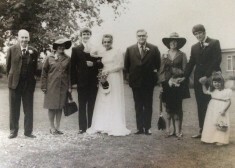 A marquee was erected upon said lawn for the wedding reception of their daughter Jean to Mr Ron Gooch from Cambridge. There were three excellent Monkey Puzzle trees across the front of their lawn, which were removed when the road was widened, and we all lost a bit of front garden. Les Boulton used to have large green houses behind his house, where he grew tomatoes which were to be sold at the door. He had a sign in the front garden with the price of the day for tomatoes and was well respected for the “moneymakers” he used to grow and sell. Pest Control Ltd used to use one of his green houses for research trials. Les had the usual fruit trees and was very adept at grafting new shoots on to root stock for new varieties. Most of his garden from the house backwards was devoted to growing vegetable, salad crops and fruit trees. He like us had chickens, but unlike us he didn’t have a weed in his garden, due to his regular attention with the hoe. 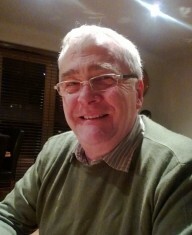 Les Boulton also worked for Eddie Thoday as well as looking after his own enterprise. Our immediate neighbours in the High Street were Gordon and Doris Welch at “Bagley Laurels (No 169 High St), and their two children Roger and Julie. Their garden at the back was full of gooseberry bushes, and during the summer they employed boys from Foxton to come and pick and box them for market. They had a large wooden garage to house not only the car but a small lorry, which was an integral part of the formation of “Welches Transport”, now a large company with the late Gordon’s son and grandchildren at the helm. My mother and Doris had a hole in the hedge at window/head height so they could chat, and Gordon would call my father round to watch on his TV the Rev David Shepherd batting for England in the Test Match. When they moved to Stapleford to live, another couple moved in and out after a few years, followed by the Minshull’s who removed many of the gooseberry bushes, sowed grass and installed a horse called Anna, that Jill the daughter of the house, used to ride. Her brother Roderick had a motor cycle which was his delight. All the houses along the High St. at that end of the village were built on one acre plots, except ours and the adjoining one which were built on one plot. As the builder Mr Haradine lived in ours he kept three quarters of an acre and sold the other quarter with the other house. The plots were ten chains by one chain, and most people had orchards of varying sizes, where they, like us, grew a variety of apples, pears plums and greengages. Eddy Thoday used to grow fruit and vegetables on the land behind his home two doors away from us, 167 I think it would be, and also behind 169 to 177. The Thodays had a market stall on Cambridge Market, where their produce was sold. The Thodays had four acres behind their own, Welches, ours, Boultons, but not much behind the end house because their garden tapered to nearly nothing at the back. The Thodays had a patch in the middle of their four acre piece where they grew the produce for their greengrocery stall, and the piece which was their one acre garden had an orchard, driveway to the land at the back and buildings to facilitate their business. When I was young I remember Mrs Thoday senior being alive, but could not be sure if I remember Mr Thoday Senior. The house had two back doors, one to the seniors rooms and the other to Eddie, violet and Julie’s rooms. I am not sure when the Clarks bought the property from Eddie and Violet, but it must have been late fifties or more likely early sixties. Most of the houses in the row in my very young days used to take in fruit boxes from Eastwoods fruit farm, on Barrington Hill, and fill them with plums generally before collection by Eastwoods and maybe others. Further along the Gatwards had a piece of land similar in size to the piece Eddie had at the back. In my lifetime it was quite overgrown and used as a jungle for expeditions by small boys! They had orchards and kept chickens for their livelihood. Mrs Hammond lived at “Wetherden” (No173). She had been widowed before I could remember and used to allow us to cross her back garden to get to Leslie Boulton’s house “Wood Glen”( 175 ish). She also paid us either 3d or 6d to beat her carpets with wicker carpet beaters. Occasionally she went away for long spells and rented the house out, and sometimes families like the Fulfords lived there. I was still quite young when Jack and Sheila Bennett bought the house and became our neighbours . During their sojourn in Wetherden they had two children Jocelyn and Brian. After they moved to the Isle of Wight, one or two families came and went, then a new family bought the house: Laurie and Peggy Morgan with their three daughters Janet, Anne and Sally and son, Patrick came and were there long after I moved away. We all used to play together, have firework parties on Guy Fawkes Night, and our families enjoyed friendship over many years. Miss Wright lived in a bungalow over the road and nearer the Garage than us. Then there was another bungalow and an orchard, where two house were built, the left hand one being the home of the Green Family. After that there was the Stierer family, and in no particular order, the Lury Family. Mark Lury formed a successful company developing and manufacturing spray nozzles for agriculture called Lurmark. Also the Wisbey Family lived in another one of those houses. They were part of the Wisbey family that owned Wisbey’s Builders at Haslingfield. Dr Erskine lived opposite us, being the first house on the left of London Road, a beautiful house and large garden which I believe has given way to a newer development of houses. Dr Townley lived at the other end of London road, being about the last house on the left and set back behind others. Dr Webb was the senior partner when I was small, and Dr Bunn joined the practice at some date while I was still at school. Roger Howlett, who lived with his parents Ralph and Hilda in London Road (house called Langham), was a good childhood friend; we both liked Dinky cars and had electric trains and both had quite extensive track for them. Their house was on a double plot so they had a big lawn set out as a tennis court beside the house where we could play. Ralph Howlett was a director of Kerridges Building Company in Cambridge, and Roger moved away to further his professional career. My Brother Peter was friendly with Charles Simpkins. He lived with his sister, parents and grandparents, named Wilson, opposite Sabberton’s Garage (Harston Motors). Charlie was brilliant at school and went to the County High School where he attained examination pass levels, unheard of in the school. However his passion was for motor cycles, engines and lawn mowers, so instead of choosing some academic progression, he set himself up in business repairing garden and horticultural machines and was greatly respected in the business world. In his teenage years my brother had other friends, some of which were with him in the Hauxton Platoon of the Army Cadets, of which Ted Lamen from Church Street was the CO. Other friends that used to come round to our house were Peter Harrison from New Road and Roy Smith from Queens Close. Peter Harrison became a quantity surveyor and Roy Smith worked for the Electricity Board after completing their education. In those days there were regular visits from tramps asking for their tea cans to be filled, and mum usually found a piece of cake or bread for them. Most of us had only seen pictures of people from other lands in books or on colour slides travellers had shown us, so when Sikh gentlemen came to the door wearing their turbans we used to be alarmed and tended not to buy their wares very often, even though they were extremely pleasant, always smiled, and offered pretty silk items. I remember one evening when the front door kept being knocked and there was nobody there when it was opened. My father crept round the front in the shadows, watched a boy knock the door and run out of the porch, with one quick stroke fathers walking stick connected with the boy’s bottom. At school next day the boy, using the vernacular, told me about it basically saying he felt it! It transpires that his friend had knocked the door three times while he hid behind a bush and then he had taken over, and was on his first knock! In the summertime when I was quite small my mother used to take me to the Tea room beside the Three Horse shoes for an Ice cream and a cold drink, while she had a cup of tea. I think that closed quite early in my life, or maybe the Three Horse shoes used it for other things. I started Harston School when I was five and had a brother five years older than me to deal with any bullies. My first teacher was Miss Jackson who started our writing experience with a slate, quickly progressing to work books. The infants’ classroom was at the front on the left as you look from the road; it had its own entrance from the front playground under the clock tower. I remember that about three children used to go to the front of the class each day to get their Malt. A large spoon was taken from the drawer and Malt delivered to the open mouths of the three in quick succession, with no stopping for refinements like cleaning the spoon. I remember crazing my mother to buy me some Malt, which she did, but the interest didn’t last long. The milk crate used to stand by the radiator and left its mark on the wooden floor for generations. At the time of the Coronation there was a fancy dress competition for children, and I won the younger section with my tricycle being converted into a pie mans’ cart, and me dressed as “The Pie man That Simple Simon Met. My brother didn’t win, but his effort was excellent with his bicycle converted into an old fashioned type crib and him as a baby within it. The only other outfit I remember was Valerie Jennings had a suit covered in sweet packets. The older children received a jam spoon and we were given a Coronation mug, which I still have. With there being no secondary school, I stayed at Harston for a year until Melbourn Village College was complete. Not like my brother who had stayed there until he was fifteen when he went to Cambridge Technical college for three years. A successful career with Barclays Bank followed, where he was a manager for many years until his retirement. My class was joined, back in the old infants room, with pupils from Newton and Hauxton in a class taken by Mr Wilkinson. He was a really interesting teacher using lots of his life’s experiences to illustrate the lessons. It was during this time that, Mr Shoote had occasion to cane pretty well every boy in the senior school, for a kind of brawl in the playground. If it had been a public school it probably would have become a tradition, and called The Harston Wall Game. We all used to walk home from school in a large group, and usually caught up with the Paper Boys who had cycled to Mrs Andrea’s shop to collect their evening papers, not sure why they picked them up there. On one occasion a tramp came along the road and took Michael Reed’s gloves from his bicycle, while he was collecting his papers, but he was seen by about a dozen eagle eyed children who gave chase. Constable Kilbey somehow got word of what was going on and gave chase on his bicycle, wrestled the man to the ground and showed him his truncheon, thereby making an arrest and receiving cheers from the assembled mass. Going to Melbourn Village College on a school bus was easy for me, because Longs kept their buses opposite my home in the Old English Gentleman Public house car park, and Mrs Beedle the landlady was on board to keep order , I could be first on each morning. I had school friends at Harston who continued to be great friends throughout my time at Melbourn. Andrew Goode from the Post Office was one I had known from day one in school, and a family that were well known to my family. My father had even taught his father to drive many years before, and his older brother Neil was my brother’s sort of age. Andrew had an air rifle and an air pistol which we used to use to shoot at tin cans in his back garden. A real treat was if we managed to get some old Wireless Valves, which gave a real pop when we managed to hit one. Alan Marshall who came from Church Street was not only a friend at school, but we both used to cycle to Haslingfield for Scouts together. He left school before me but our paths crossed many times later in College, business and later when he was a governor of my children’s secondary school. Both Alan and Andrew had the same interest in photography as me, all being members of the photography club with Mr Wilf Ogden. Alan and I developed films in our bathroom and in the school darkroom, often processing photographs for various teachers in the school. Andrew and I both learned to play the guitar in a lunch time club with Mr Geoffrey Brace. I enjoyed school holidays and journeys to Paris, The Peak district, Snowdonia, Lake District and the Norfolk Broads with a variety of teachers. The school had a good youth club and I was able to assist in building both an Enterprise and a Wyvern 106 Dinghy, in addition to the canoe I built for myself in Mr Hunter’s woodwork class. When I left school I joined Marshall Of Cambridge to complete an apprenticeship in aircraft engineering, and on my first day realised I did not want to be doing that kind of work for ever, so I studied at technical college to get on in life. Marshalls were very good in supporting me through block release at Cambridge College of Arts and Technology, but at that time didn’t have a way for engineering apprentices with qualifications to move into staff positions from the works after completion of their apprenticeships. I left and Joined T.I Research laboratories where I continued studies and progressed. Following that I followed a route through sales, management directorship and in my last four years work for the civil service. Outside of work whilst in Harston I was an Assistant Scout leader, helping reform the Scouts, Youth leader, Sunday School teacher and Deacon at the Baptist Church (see scout memories). The Railway station was operative and had at least one London commuter. He was a man who lived in the house called “Wix” on the High street: we, the Wicks, and he often got each other’s mail. As a family we used to use the train once or twice a year, usually to go shopping in Oxford Street, Kensington High Street or the Ideal Home Exhibition in Olympia. As time went on it was quicker to go to Cambridge and catch trains on the Liverpool Street line, but that was pre electrification. Mr Clutton was the station master and he had a son called Howard. Tom Want was the signalman and others did work there, but I’m not sure of their names. Reg Radford might have worked at the station at one time. The village had many shops. When I was young I had to have my haircut at Phylis Jackson’s ladies hairdressers, opposite the Village Hall, but when I was older I went with my Grandfather to Cambridge, until for a short time a Barbers opened between the Coach and Horses and the Surgery in the High Street. The same shop was used by Jack Northrop briefly for his newspaper business. Opposite was the Goode’s house (No 53 high St) with the Post Office being part of the House. It had once been two houses, I think, so it had two front doors, one on the end which was the Post Office. Knight’s shop (No 51 High St) was originally a kind of prefabricated building with a canopy at the front. Some flowers and vegetables, sweets and ”Eldorado” icecream, grocery bits were sold, and some very early frozen food called “Frood” I seem to remember; I think later they had Birdseye. During my time in the village Mr Knights erected a new brick built shop and house around the original, before dismantling it and taking away their residential caravan. The shop in the house next to Green Man Lane (No 49 high St) was there for a while, and Monica Wisbey used to serve in it. Later Andy Bowden used the same premises as the dairy. Ayres shop (No 29 High St), which became Sargaents, was between Phylis’s hairdressers and Ernie Collins’ decorating shop, selling wallpaper, paint, distemper, brushes etc., which was to the right of the drive next to Ayres. He also did painting and decorating for a job. These days were pre Emulsion paint and Rollers! There was cobbler in Green Man Lane, and Odds and Ends Corner, by the memorial, was opened by Ida Rodwell, and later taken over by somebody else and given a change of name (Vera’s Boutique- haberdashery). Ida sold sweets crisps, haberdashery and a few staple items. Mrs Burls shop (No 28 High St- present PO) was quite small with a door on the corner. Mr Burl used to cycle to work I seem to remember, somewhere in Cambridge. I think Burls sold Lyons Ice Cream with Ayres selling Walls, but it could have been the other way round. Harrison’s bakery (No 1 Church St) was also a shop. The parents lived in the adjoining house and Maurice Harrison lived in New Road with his wife, two sons Peter, Gerald and a daughter Elizabeth. They used to fire up the bakery on Christmas day and villagers used to take their turkeys early Christmas morning for Maurice to roast them in the big bread oven. We did that at least once until my mother had a larger oven. Maurice would never reveal the secret of how he put the crosses on Hot Cross Buns. After they ceased baking he pursued a new career as a commercial traveller, in current language a Representative or Sales Executive. Charlie Rogers used to be their delivery man, then after the bakery closed he started his own business from his home in the lane behind Ayres shop, buying in bread and delivering it: I am not sure how long that lasted. Peter Harrison became a quantity surveyor and Gerald went in the RAF. He actually helped me make a crystal set with which I used to listen to Pick of the Pops, I think it was called, on Saturday nights. Two doors south from where we lived (No 167, I think) Eddy Thoday used to grow vegetables and also had orchards which extended behind our garden. He employed Les Boulton and sold his produce on his market stall on Cambridge Market. I remember watching, Les or Eddy and Violet Thoday boiling beetroot in one of the sheds before market day, while I was being entertained by Eddy’s and Violets daughter Peggy and Julie Welch and others with their wind up gramophone. I ought to know Pat Boones Love Letters in the Sand off by heart, the number of times they wound it up and played it over. The Clark family bought the property and changed the emphasis from vegetables to more fruit. David and John planted more trees and picked and packed various fruit for bulk sale. The Chapman family, well two families I think, had caravans in the centre of the village on the opposite side of the High St from between the garage and the chapel. They used to sell Turf and other things. Later they built two nice houses to replace the caravans. There were children in both families but I only remember Micky and Fay, who was in my class at primary school (third row back, right in picture above). There were two fish and chip vans at first: Underwoods, in a blue van that I don’t remember patronising, and Wrens who came on Wednesday evenings, and a lunchtime for a short while. You could hear the bell which the driver used to hit with a large spanner to advise of presence. Later they installed a loudspeaker and he used to say, “Wrens that Green and White Fish and Chip saloon is now outside your door”. Chips were 3d, 4d, 6d and fish was about 8 or 9d, making fish and chips a shilling at the start. I think there were increases over the years, but batter scraps were free I seem to remember. Jefferies from Saffron Walden brought round wet fish once a week, and Barkers the butchers from Gt Shelford used to come round twice a week. The CO-OP mobile shop came round in the early days, as did Somerlite Brown with items of hardware and ironmongery, brushes and the like to support their “Somerlite” oil business. Paraffin was sold from a tank at the back of the van and used in oil lamps and heaters, or just getting your fire going. The Kleeneze man called monthly, and Mr Tucker the Prudential insurance man with fingerless gloves seemed to call something like fortnightly. Hays had the dairy and we used to craze Gerald Ives to stand on the horse drawn milk float. He later had a van . Andy Bowden took the business over and David Jeffries used to work for him on Saturdays and school holidays. I remember the meadow next to the Three Horseshoes being cultivated and a big sign saying Stockers Roses to advertise a new enterprise by the Stocker family. This page was added on 10/09/2016. Nice to see the Hammond and Wilson family, my Great Grandmother s sister was Ada Wilson. Thanks for your comments Christine. The granddaughter of Ada Hammond still lives in the village and I will pass on your comments when I see her. She is not on email. Please do send your photos of Ada & Dorothy if you find them- we would like to do more on the Hammond-Wilson family.